Season fish fillets with salt and pepper, and roll in finely ground bread crumbs. Fry until golden, and fish flakes when tested with fork. Ladle 1 ounce of spaghetti sauce over each fillet, and sprinkle each generously with mozzarella cheese. Broil until cheese melts and browns slightly. Serve immediately. "Garnish with a slice of pineapple, if desired. Good when accompanied with french fries." 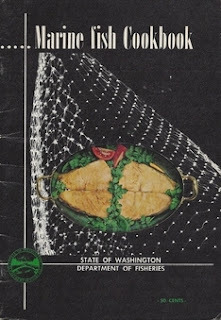 More "Lost" Recipes from "Marine Fish Cookbook"